Composting is a way of recycling your food scraps and yard trimmings – thus keeping them out of landfills — and turning them into a valuable material to use in your garden. Using compost on your plants will add nutrients to the soil and improve absorbency thereby helping your plants to grow stronger. And, it’s fun to produce compost at home instead of buying it at the nursery. Composting is good for the environment, your plants, and your wallet. Heck, these days it’s even good for your image – didn’t you know that “green” is the new black? Last week I made my second compost bin out of a trash can. 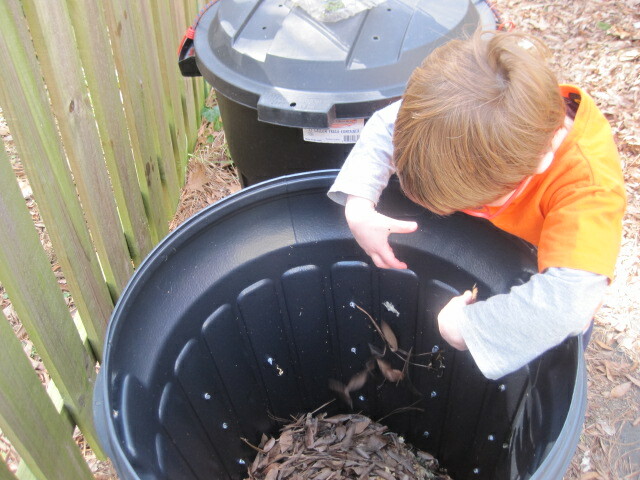 Now I’ll tell you what I’ve learned about the very basics of beginning to compost. 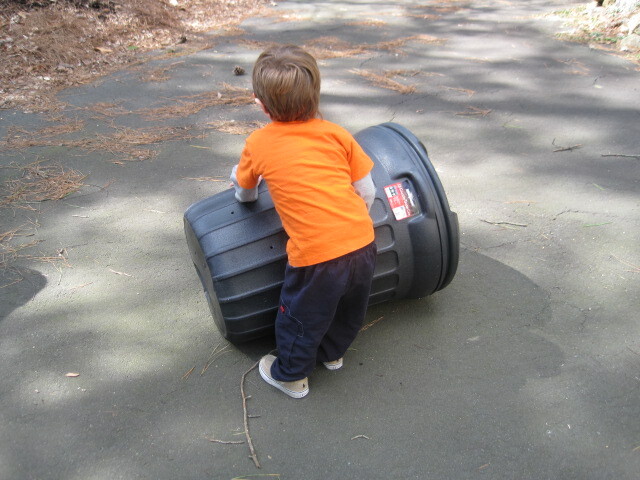 Before I started composting, I was a little intimidated by it. I didn’t know exactly what I could compost and I thought there was some formula I had to follow. There isn’t really a formula, but there are things to keep in mind. Remember, however, that you can make a lot of composting “mistakes” and still end up with compost—it just may take longer than other peoples’ compost or it might smell funny along the way. This EPA site offers a nice list of things that can and cannot be composted. The highlights: along with both kitchen scraps and yard trimmings, dryer lint, animal and human hair, shredded paper, newspaper, dust bunnies, and eggshells can all be composted. Do not compost meat, bones, fats (including grease), or dairy products. Compostable materials can be thought of in terms of “greens” (rich in nitrogen) and “browns” (rich in carbon). Greens are things like fruit and vegetable scraps, and browns are things like leaves and twigs. This site does a good job explaining the science behind balancing greens and browns in your bin. I’ll give you the take home message for an easy way to make compost: add roughly equal amounts of both kitchen scraps (such as fruit and vegetables, coffee grinds, egg shells) and leaves. 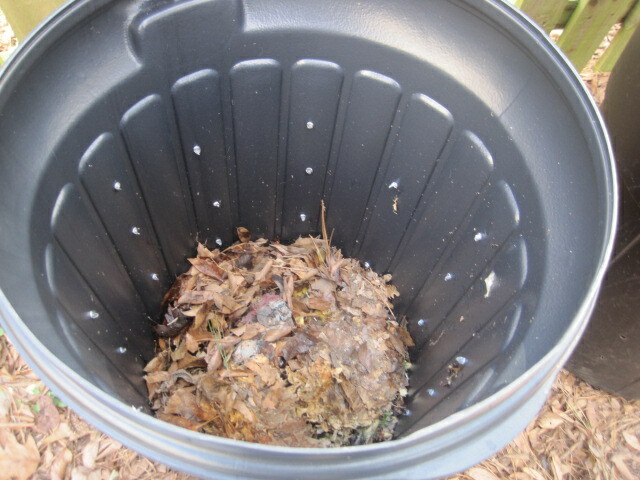 Shredded leaves (also known as “leaf mold”) are a great brown material to add to the compost bin. Our town offers free delivery of shredded leaves during the fall and winter season when they’re picking up our raked leaves at the curb. I had them dump a pile of shredded leaves a year ago and I’m still working my way through it. I use the leaves as mulch for garden beds, and when I was working on my little front yard landscape project, I dug the leaf mold into the soil to improve drainage (we have heavy clay soil). I keep my compost bins next to the pile of shredded leaves so that when I’m in need of brown material to add to the bin, I just pick up some of the leaves and toss them in. Simple. It is important to maintain the proper moisture level in the bin. The material should be like a very slightly damp sponge – not so wet that you can squeeze water out of it. If the pile is too dry, it will take much longer to break down; if it is too wet, the beneficial little microorganisms won’t get the proper amount of oxygen they need to help break everything down. This site recommends the following as a quick moisture test: Squeeze a handful of the compost. If water drips out, it’s too wet; if the compost crumbles apart, it’s too dry; if it stays compacted without water dripping out, it’s perfect. 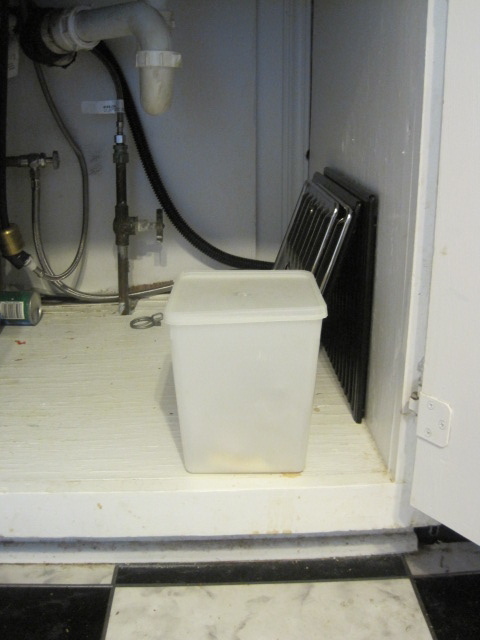 For items I collect in the house to compost, I keep an old plastic container (with lid) under the kitchen sink. When it’s full, I just take the container out to the bin and dump the contents in. It’s important that your container have a lid because otherwise it will quickly attract little fruit flies and other uninvited guests. So let’s get this compost bin started. 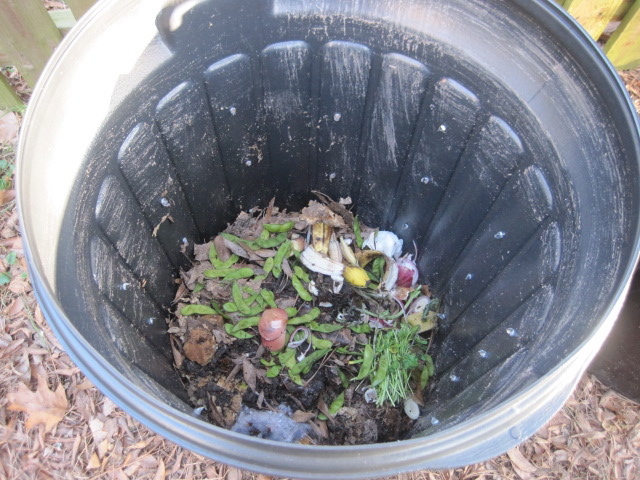 Begin by filling up the bin about 1/4 of the way full with dirt, topsoil, or, if you’re really feeling fancy, some of the compost from your first bin (complete with earthworms!). Add some leaves (if they’re shredded, they’ll break down more quickly). Add fruit and vegetable scraps and anything else you’ve collected in the house. If you’re interested in speeding up the decomposition, cut up the food scraps into small pieces before putting them in the bin. I don’t do this because I’m lazy. Also, if you add eggshells to your bin, it’s a good idea to crush them because they take a long time to break down. Give it all a pretty good watering from the hose. While I occasionally use a thick stick to stir everything up, I generally just put the lid on, turn the bin on its side, and have Charlie do all the work for me. 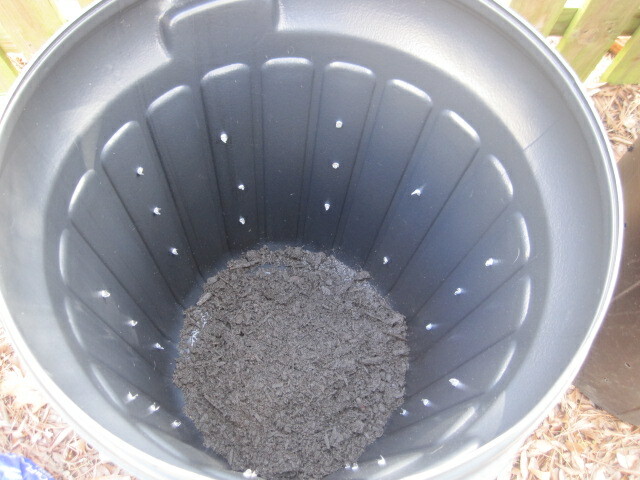 Now that the bin is started, just remember that for every “layer” of green material you add, throw a layer of leaves in. Then roll the bin about once a week. Almost you inspire me…. But I don’t have Charlie to do the work. Come on! You’d be an inspiration to your neighborhood, and Jonas would be so pleased. What are you going to grow in your garden? You can’t mess up zucchini, though the deer love them. I have several garden beds of perennials that will love a little compost once it’s ready. I’m hoping to start a vegetable garden this spring too and if I do, you can bet it my veggies will be nourished with some compost. Dryer link? Human hair, seriously? I know, incredible. I love that you can compost dust bunnies — almost makes me want to give the house a good cleaning just to compost the dust. Almost.